ARLINGTON, Texas (AP) — Two straight days facing their former aces, two straight early deficits. And now two straight wins for the rebuilding Texas Rangers against the World Series-or-bust Chicago Cubs. 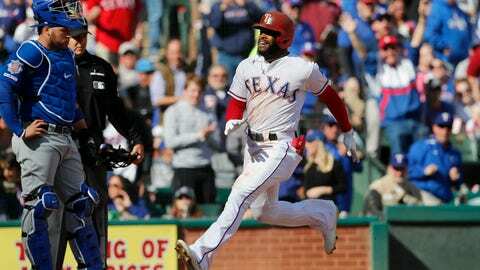 With one out and Chicago playing five infielders, Gallo raced home from third base when Pedro Strop’s pitch to Nomar Mazara bounced past catcher Willson Contreras and high onto the net behind home plate to give the Rangers a series win after the Cubs’ 12-4 victory on opening day. Jose Leclerc (1-0) stopped a Chicago rally in the eighth and got the last four outs for Texas. Strop (0-1) allowed Gallo’s leadoff double in the ninth, a high drive just over leaping left fielder Ben Zobrist at the wall. Pinch-hitter Shin-Soo Choo’s groundout moved Gallo up. Hamels couldn’t hold a 4-0 lead, allowing Delino DeShields‘ first career grand slam for a 5-4 deficit a day after Darvish took the mound for Chicago up 3-0 before walking seven of his first 13 hitters and failing to get through the third inning. Ultimately, the Chicago bullpen faltered again. Montgomery didn’t retire any of his three batters a day after Carl Edwards Jr. let all four of his reach, including Gallo’s go-ahead homer. Chicago relievers have given up 11 runs in two games.